Elizabeth couldn’t decide if she wanted to do a studio shoot or an outdoor shoot, so we threw caution to the wind and did both. This maternity shoot was such fun. I photographed Elizabeth’s first pregnancy, in 2012, and was honored and delighted when she asked me document her second pregnancy as well. Here she is at 32 weeks, with baby number two. I love the elegance and sophistication of the studio images, and the drama and natural beauty of the beach photos we took at Tod’s Point in Old Greenwich, CT.
For the first shoot, Elizabeth came to my studio in Manhattan after work one evening. We couldn’t stop laughing. We threw on some tunes and got to work. Elizabeth giggling as she indulges me in trying out some of my posing ideas. A few days later, I met up with Elizabeth and her husband and son in Old Greenwich, CT for a quick beach shoot. 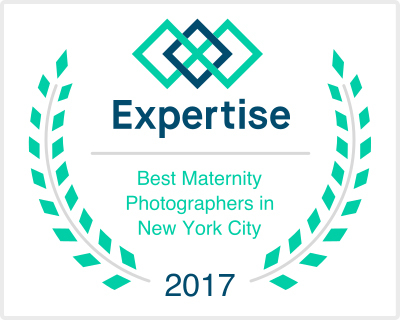 It was great to combine NYC maternity studio portraits, with Greenwich family photography. Greenwich is similar to Hamptons family photography in that they both have gorgeous beaches, and both are close to NYC. I feel very luck to live in New York, and close to so many lovely places. This means that clients can easily do an outdoor shoot AND a studio shoot in Manhattan, if they want both looks. Yes, I am based in Manhattan and East Hampton, but nights like this in CT makes my part-time role as a Greenwich Family Photographer all the more appealing. We had some fun taking photos along the shore, then we moved to a slightly different location at the beach. It was a warm evening, and we naturally gravitated towards the water. Before I knew it, we were all almost waist deep in the ocean, splashing and playing in the waves. Being a Greenwich Family Photographer definitely means I have some beautiful locations to work with. I had come to the shoot from another event in CT, and, through some remarkably bad planning on my part, was wearing a black silk dress in the ocean. Oops! Well worth it. Swimming fully clothed? Jack couldn’t believe his luck. These three are such a lively and loving family. We were all laughing so hard, and I’m so happy I got to capture some of the fun they have together. I’m so happy that their energetic and loving family dynamic comes through in the family portraits. Here I am, below, laughing and getting soaked. If you’re planning family portraits, be sure to check out my family photo shoot tips to help you prepare. Thank you guys for a wonderful evening! This was such fun! Curious what my clients are saying about their shoots? Check out my family photography reviews to get a sense. UPDATE: Here’s Baby Stella’s Greenwich CT first birthday photo session. UPDATE 2: Here’s Elizabeth pregnant with her third (!!) baby, from our Central Park Maternity Session. Want family or maternity portraits of your own? Want to get cracking on your holiday card? Contact me using this form to schedule a shoot, or to sign up for a shoot at one of the destinations below. Although I am based in NYC and the Hamptons, I love working as a Greenwich family photographer and hope to come back often! Central Park, NYC: Most of the fall! Daisy Beatty is a portrait photographer based in Manhattan and East Hampton NY. She specializes in vibrant images of families, children, newborns, pregnancy, and dancers. As well as winning headshots for actors, models, executives, artists, and online dating. For more information please contact her or visit her website.